Typically, we close out the month with recommendations for further reading. That's easier than usual this month, what with the rest of the adventures of Fafhrd and the Grey Mouser available from Amazon. But now that you've seen the iconic duo in action, don't be surprised if you start to see them more and more in works not written by Fritz Lieber. Earlier in the month, we mentioned that Discworld's Cohen the Barbarian often found himself paired with Rincewind. Just this month, while preparing for an upcoming miniature wargame, I encountered them in a very unlikely place. Osprey Publishing released a Three Musketeers themed set of rules called, En Garde! The back pages of that historical ruleset include a brief supplement of rules suitable for fantasy games. 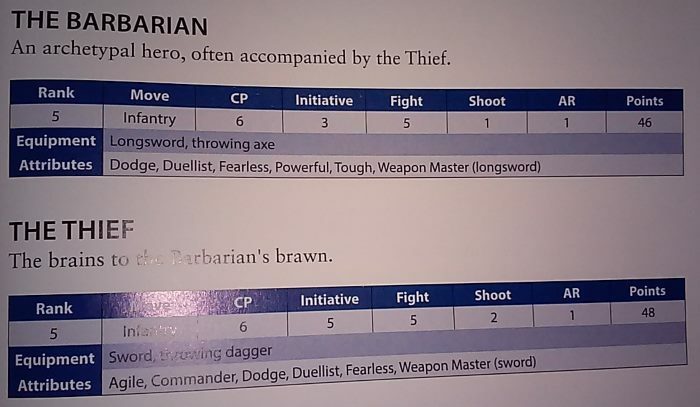 Craig Woodfield, the author, knows where to find the good stuff, as evidenced by the inclusion of a stat line for a "Witch-hunter" that cannot be mistake for anything but Robert E. Howard's Solomon Kane. 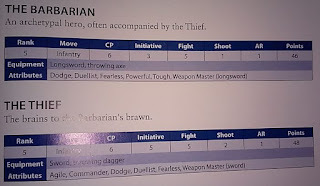 But he also had the good taste to include stat lines for "The Barbarian" and "The Thief". Oh, and I forgot to mention that I succeeded in my goal of talking about Faf and Grey without talking about D&D for all but one post this month. No low hanging fruit for me, thankyewverymuch!